This story has been updated with information on a letter from several organizations requesting that the event be canceled. Penn State has canceled a planned recognition of the late Rene Portland at an upcoming women's basketball game, citing concerns about the former Lady Lion head coach's "personal views toward our LGBT communities." Portland, who coached the Lady Lions to more than 600 wins in 27 years, died at the age of 65 in July after a battle with cancer. The decision came after several university groups sent a letter protesting plans for the commemoration. According to an email sent to ticket holders from the athletic department and AD Sandy Barbour on Saturday night, Penn State "had intended to recognize her service and accomplishments, and those of her student-athletes," at the Lady Lions' season-opener against Providence on Thursday night. "Coach Rene Portland had a significant impact on the history of women’s basketball, both nationally and at Penn State," a statement included in the email said. "Student-athletes who competed under her represented our University with pride, and have gone on to lead successful lives and careers. "However, we also know that Coach Portland’s personal views toward the LGBTQ community were wholly and starkly inconsistent with Penn State values. Her individual views did not reflect the importance we place on embracing human dignity by creating a welcoming and supportive environment for all." Four university organizations -- BRIDGE Diversity Alliance in the Department of Psychology, Out in Science, Technology, Engineering, and Mathematics (oSTEM), Graduate Alliance for Diversity and Inclusion (GADI), and College of the Liberal Arts Committee on Diversity, Inclusion, and Transformation (CoDIT) -- sent a letter to Barbour and Penn State President Eric Barron requesting that the commemoration be canceled. "Rene Portland’s anti-lesbian policy is well known ... and overshadows any positive contribution that she made to the university community," the letter said. "To commemorate a person associated with legacy of prejudice sends a harmful message to students, faculty, and staff about who is valued and whose experiences can be erased." An athletic department spokesman declined further comment. "The statement released on July 23, at the time of her passing, recognized Coach Portland’s contributions," the email to fans stated. "Together, Intercollegiate Athletics and University leadership have determined that further recognition at this time is not necessary or appropriate." Portland took over the Lady Lions' program in 1980 and built it into a national power, leading the team to 21 NCAA Tournament appearances, including one trip to the Final Four. Her time at Penn State came to an end shortly after accusations that she discriminated against players she believed to be gay, when in 2006 former player Jennifer Harris filed a lawsuit against Portland and the university. Harris claimed she was dismissed from the team because of her perceived sexual orientation. Portland contended Harris's dismissal was "based solely on her performance on the basketball court and her inability to make a positive contribution to the team, nothing more." Comments Portland made to a Chicago Sun-Times reporter in 1986, in which she said she forbade lesbians in her program, also resurfaced at that time. She was fined and suspended one game by Penn State after an internal investigation. Portland disputed the findings and maintained that she was committed to non-discrimination. She resigned in 2007, weeks after the lawsuit was settled. Accusations by Harris and other former players were the focus of the 2009 documentary "Training Rules." Portland is 20th in all-time NCAA Division I women's basketball victories with 693, 606 of which came at Penn State. She was inducted into the Pennsylvania Sports Hall of Fame in 2001 and the Philadelphia Sports Hall of Fame in 2017. She also is in the Naismith Hall of Fame with the Immaculata Mighty Macs of the early 1970s. Portland was a standout on Immaculata teams that won three consecutive Association of Intercollegiate Athletics for Women national championships, before women's basketball was an NCAA sport. During Portland's tenure, the Lady Lions instituted the first "Think Pink" game, among the first of its kind in the nation, to support breast cancer research and awareness, an effort that evolved into the year-round Pink Zone charity. As you are aware, in observation of Coach Rene Portland’s passing, we had intended to recognize her service and accomplishments, and those of her student-athletes, at the upcoming game against Providence. However, we have decided to forego the planned commemoration in light of concerns regarding her personal views toward our LGBTQ communities. Below you will find the statement we are sharing in response to inquiries about our decision. As always thank you for your continued support of Penn State Athletics and Lady Lion Basketball. Penn State Athletics has a history of observing coach and administrator tenures upon their passing. 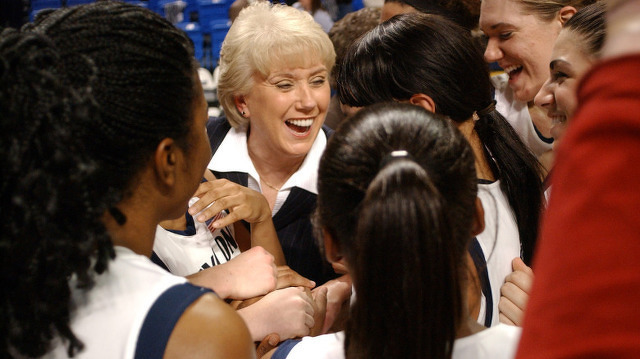 Coach Rene Portland had a significant impact on the history of women’s basketball, both nationally and at Penn State. Student-athletes who competed under her represented our University with pride, and have gone on to lead successful lives and careers. However, we also know that Coach Portland’s personal views toward the LGBTQ community were wholly and starkly inconsistent with Penn State values. Her individual views did not reflect the importance we place on embracing human dignity by creating a welcoming and supportive environment for all. The statement released on July 23, at the time of her passing, recognized Coach Portland’s contributions. Together, Intercollegiate Athletics and University leadership have determined that further recognition at this time is not necessary or appropriate. 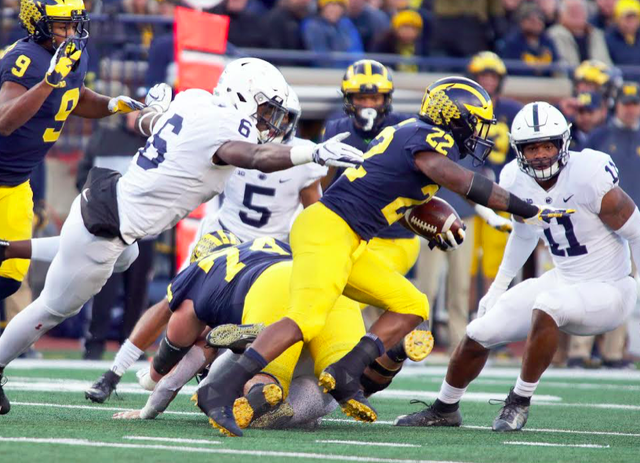 Penn State got beat on Saturday by a Michigan team that was good at everything and even better at the things Penn State was not good at. It made for a long afternoon if you're a Nittany Lion fan and an even longer night for those that had once hoped Penn State's season would match that of the past few years.